There’s been a rather dirty word thrown around since Taken live up to its title and caught the imaginations of a wider audience, dadsploitation. Unfortunately, there are films that embody the zeitgeist of the word. Movies where clearly a studio is trying to cash in a trend and aiming it at what they believe to be the target audience of older men who fondle themselves to fantasies of saving a bus load of cheerleaders who fellate them for their efforts. 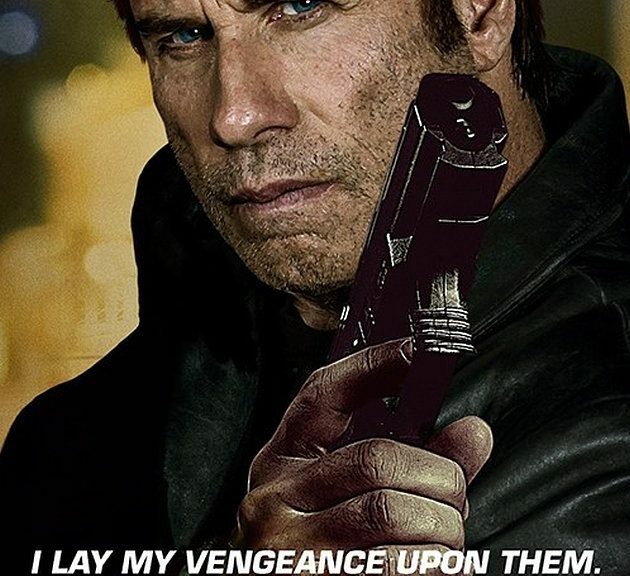 Thus we have I Am Wrath  starring the Travolta and his amazing technicolor hair. Someone kills his wife because she’s crunched the numbers on water safety and now she knows too much. Luckily for the premise of the movie, Travolta is an ex special forces who has loads of training and hunts down her killer for some revenge but mostly for fun. Considering he seems to be having a lot of fun for a guy freshly made a widower. Tim then talks about Armed and Dangerous(1986) staring Eugene Levey and John Candy. They play a couple of guys who get fired from their day jobs and end up working together as security guards. This causes them to stumble into a plot by the company to steal merchandise and rip off other employees. It’s best watched while reminding yourself that it’s still better than Candy’s last film, Wagon’s East. Weltall then talks about Precious Cargo. It’s back in the same cash-in vein as I Am Wrath. This time it’s Bruce Willis grumping his way around a green screen. It’s a heist style movie and, would you believe it, there are betrayals of trust? Shocking, we know. Next we’ll tell you that there are action scenes in which Willis suffers only a torn sleeve and a mild grimace of disappointment.